A quick look at books about delphiniums shows that many begin by referring to the recognition by the ancient Greeks of the dolphin-like appearance of the unopened flower. 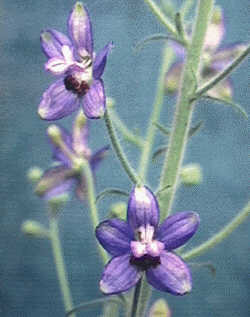 The next sentence then introduces Delphinium staphisagria and mentions the almost magical properties of its poisonous seeds as herbal medicine or pesticide. To most gardeners, however, this plant remains just part of Greek mythology, rather than a living representative of the flora of Greece. D. staphisagria thus represents a challenge but in 1997 I succeeded in growing it to flower. Seed of D. staphisagria, which is a biennial, is seldom available and my first attempts to grow it some years ago were with seed Shirley obtained via seed exchanges between Botanical Gardens and Universities. This time we bought seed listed by the Archibalds, which had been collected from plants growing among open scrub at 750m at Anapoli, Crete. The plant name refers to the resemblance of the leaves to a grape or 'wild raisin' but you could be forgiven for thinking it was the large seeds that looked like raisins. They should certainly not be kept in the cupboard with your dried fruit! The average size for the long axis of 32 seeds was 6.2 mm and the average width across the seeds was 5.2 mm. 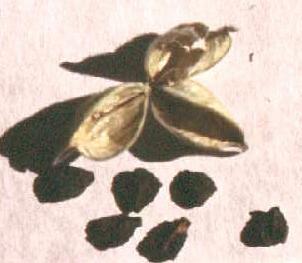 The seeds are angular with flat facets and a rough, ridged dark brown skin. The first step is to germinate the seeds, so we tried several methods. I chitted 10 seeds on wet paper towel in a box on a propagator at 22ºC. Shirley put her 10 seeds on wet paper towel in a box that went into the fridge for a cold, wet soak before keeping them at room temperature. In view of the hard skins, I chipped 5 seeds as is often done for seeds of sweet peas . After 16 days, there was great joy because one chipped seed had put out a root. That was in February, but it was to be the only germination until after I abandoned chitting and sowed the remaining 9 seeds in the garden in early May. Four weeks later, after some warm weather and occasional rain, three more seedlings germinated and grew to plants that flowered in September. Obviously, we are unable to provide a more reliable recipe for germination of this species than commiting the seeds to the care of mother nature. The first germinated seed was sown in a small pot of compost and quickly grew to 'world record' size for a delphinium seedling, measuring 7cm (2.75in) across the cotyledons. Growth from then on was uneventful, producing a rather lush plant with a hairy stem, fairly similar to the closely related biennial species D. requienii but without the glossy surface to the leaves. 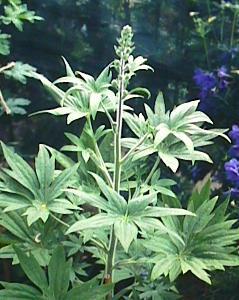 Unlike D. requienii, the foliage has no offensive odour, even if crushed. The flower spike emerged by early July and the flowers opened after another two weeks. 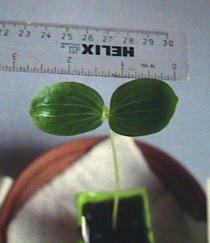 The bloom is a very loosely-packed, tapered raceme with quite small individual florets (40 mm diam.) held on stiff pedicels (90 mm long at base of bloom) with a bract and a pair of bracteoles right at the base. The bloom was 50cm long with 27 florets and the blooms of the later plants were of similar size, giving plants with a total height of 1.2m (4 ft). 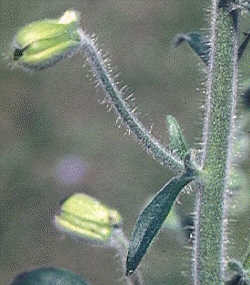 A notable feature of the floret is that the spur is little more than a nob on the back and is far shorter than for the smaller flowers of D. requieni. Flower development is interesting in that sepals are greenish yellow on opening. Colour then develops quite slowly, starting from a deep inky-blue edging, moving inwards along the veins and spreading out until the sepals are completely blue. 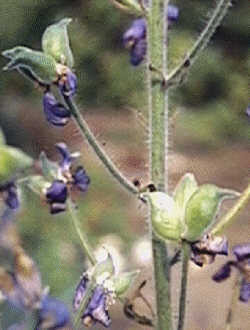 The petals forming the eye also become coloured and the prominent anthers are purplish brown. The flowers of the plants that grew outdoors in strong sunshine became quite purple, so it is easy to see how one can be confused by descriptions of the colour of this species given in Flora. The flowers produced plentiful supplies of pollen, so I tried cross-pollinating with D. requienii, using emasculated florets of the latter as the seed parent. These set seed, so the next step will be to find out what sort of plants they produce. (Not done due to house move) The flowers of D. staphisagria also set seed quite readily but, at that stage, the first plant suddenly developed a nasty fungal infection at the base of the stem. It seemed likely to die before the seed could mature so, in desperation, I cut off the bloom and kept it in water containing Chrysal cut flower food for the next two months. This worked and seeds developed even on some of the laterals. Ripening of the seeds seems to be very slow under UK conditions and those set on the plants in the ground were too late to ripen at all. It is interesting that even under bad conditions, seeds have their characteristically large size. The thick-skinned inflated seed pods contain just two or three seeds. The seed yield from this species is consequently much smaller than from D. requienii, which produces 35+ smaller seeds per floret. The plants die once the seed has ripened. I ended with four times more seeds than I started with. At this rate of multiplication I would never have sufficient seed to offer D. staphisagria in the seed list of the Delphinium Society. I have no regrets about this, as my impression is that it has less to offer as a plant for garden decoration than D. requienii. I am now satisfied that I have seen the full life cycle of this fascinating plant. However, it must produce more seed in the wild, or the ancient Greeks would not have had enough to make insecticide powder. To check this, I would of course need a trip to the Greek holiday islands to obtain personal experience of the environment where it grows! Seed said to be of this species is sometimes offered by Commercial seed suppliers and Specialist Societies. This winter, 2000/2001, we ordered seeds from The Hardy Plant Society and Chiltern Seeds. 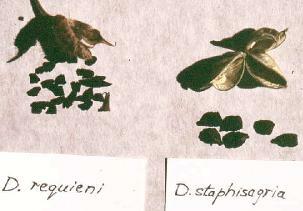 In both cases the seed is too small to be D. staphisagria. We have checked with Prof. Cèsar Blanché, an authority on delphiniums of the Mediterranean area, that seed size is indeed a clear distinguishing feature between this species and the rather similar D. requienii. In our experience, seed of D. requienii is smaller and of a recognisably different shape. Plants of this species are extremely prolific seed producers and the seed germinates very easily.